Consider filling your children’s Easter basket with something other than chocolate or sugar treats. Here are some unique filler ideas to get you started. With the Easter holiday coming soon most parents are thinking about what to put in their children’s Easter baskets. Here are some great ideas to add some Easter fun to your child’s Easter basket and spare the extra dentist’s visit. Although jelly beans and chocolate eggs are always popular with the kids, parents may want to include some not so sugary alternatives. Think of their Easter basket as sort of an “Easter stocking” instead. Use your imagination! There are a multitude of different things to include in an Easter basket that are just as enjoyable as traditional Easter basket ideas. Your local dollar store can be a treasure trove of affordable but unique ideas. Games, books and movies are just a few things that you can consider. Toys are always a hit with kids. From Yo-Yo’s and “Slinkies” to popular action figures, toys make a unique Easter basket idea that is sure to delight your child. 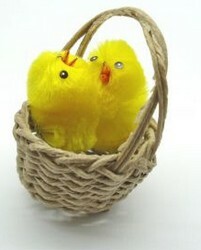 You can also go with plush toys like fuzzy Easter chicks or soft and cuddly Easter bunnies. Keep your child’s age and gender in mind as you consider what to include, as every toy is not suitable for every child. It has been said that reading to your child brings many benefits to your child’s development. An Easter themed story book is not only a more healthy Easter basket idea, but you now have a great chance to spend some quality time with your child as you both settle down and enjoy a good story book. If you child is reading on their own, don’t you think they would love a brand new book to enjoy? Let them read to you so they can show you how good a reader they are! Imagine your child’s surprise when they see that the Easter bunny even gives out movies! They don’t necessarily have to be an Easter theme. Think how excited your child will be when they see a DVD of their favorite character in their Easter basket. Including a favorite CD for them to enjoy is equally pleasing. They can sing along to their favorite songs as they enjoy their new toy or hunt for Easter eggs. A timeless, popular choice, a brand new box of crayons with a fresh Easter coloring book is always a hit. Coloring is a great way to let a child’s creative skills grow as well as an excellent way to get your child to relax after an exciting day of Easter egg hunting. There are other sweet snacks that make great Easter basket treats. Most kids love fruit roll ups which, depending on the brand, are much healthier than candy. How about raisins? Even if you choose chocolate covered raisins, there is still a health benefit to your child snacking on a handful of fruit instead of a handful of sugar loaded candy. Make some Easter cookies. Mom always says homemade is best! Yes, cookies contain sugar, but if you’ve made them yourself they won’t be loaded with preservatives and dyes like store bought cookies are. Of course, since they’re homemade they’ll taste better too! Depending on your child’s age, money is a great Easter basket idea. This idea is best for older children (coins are a choking hazard for young children). Get some of the dollar coins that are now being circulated. Their shiny appeal will bring a wide smile to your child’s face. Giving them a few dollars to spend is a great opportunity to start teaching them how to manage money wisely; life long habits start early! Give your child healthy alternatives to conventional Easter basket candy and keep them just as happy without the worry of too much sugar. A great book, movie or CD gives you a wonderful chance to spend quality time with your child. Some bright and shiny dollar coins are your opportunity to teach your child all about managing money wisely. Toys, crayons and coloring books are a great choice for unique Easter basket ideas. Your child will have long lasting Easter basket goodies and you won’t have to worry about all that sugar they’re eating. Brenda Prevost is owner and founder of AllHolidayTreasures.com which sells decorations, lights and costumes for Christmas, Halloween, Easter, St. Patrick’s Day and other holidays.